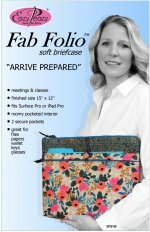 Eazy Peazy's latest pattern--the Fab Folio– is a soft way to give organization to your life outside the home. The Fab Folio is designed to carry your Surface Pro or iPad Pro, a notebook, file folders, wallet, pens, glasses and phone with a professional look and style. 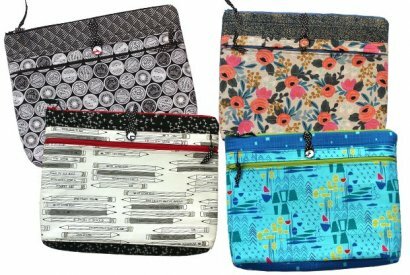 Takes the place of a purse or tote with two zippered secure pockets and an outer pocket plus there is an inner divided pocket. All this convenience comes in a finished size of 15” x 12”. Shops take note, there are add on sales including poly covered foam, non-woven fusible interfacing, 14” zippers and Wonder Clips.